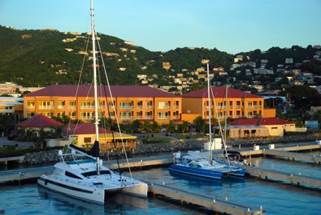 The Yacht Haven Resort is a large retail, restaurant and commercial site adjacent to a cruise ship port. Constructed by Manhattan, the 169,000-square-foot facility has nine retail shop buildings, a marina office, a condo building with twelve privately-owned condos and three open-air restaurants, one of which is in the middle of the bay surrounded by the yacht marina ships. The project includes 10 small kiosks for retail and two water features. Other amenities are tennis courts and a pool house adjacent to a tropically themed pool. The property has underground cisterns for rainwater collection. Manhattan provided preconstruction and general contracting services for this project. Project Design by HKS, Inc.